Living a Fit and Full Life: Aqua Dragons are the Perfect Pets for Kids! Aqua Dragons are a unique kind of crustacean called Artemia, that have a biological process called Diapause that allows them to hibernate, hatching once in contact with water. Five years ago, Holden and her partners launched a successful range of hatch-and-grow Aqua Dragons kits with the goal of providing curious-minded people and animal lovers everywhere with their own unique pets. Hatching and growing Aqua Dragons helps children learn important values like caring for a living creature and being responsible as it pertains to feeding, as well as how to treat live animals with respect instead of as a science experiment. Kids will also learn about science, anatomy, biology, marine biology and even history and geography through playtime with their Aqua Dragons. 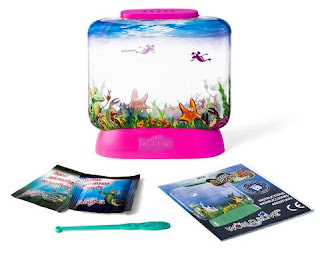 The Aqua Dragons Sea Friends basic is the best value item in the range, including everything you need to set up and care for your tiny Aqua Dragon pets at the lowest price. The Aqua Dragons are from the crustacean family, a species called Artemia Salina. They have been living in salt lakes and seas on Earth since prehistoric times. Aqua Dragons eggs have a natural ability to dry out and survive droughts, waiting to come in contact with water to hatch, this special ability to hibernate is called “diapose”. In the following 45 days after hatching, these small beings can grow up to 1cm long and live from 45 days to a few months. Caring for your Aqua Dragons you will see them eat, play, grow and learn about the differences between males and females, and even how they reproduce. A full color Sea Friends decorated tank with lid - choose your favorite colour! Aqua Dragons are the perfect pets for kids! Aqua Dragons are from the crustacean family, a species called Artemia Salina. They have been living in salt lakes and seas on Earth for a long time! Aqua Dragons eggs have a natural ability to dry out and survive to thrive again and again. This is one reason that makes them perfect for kids. Simply add your Aqua Dragons Eggs and bottled spring water to your Aqua Dragons tank and after about 24 hours you should see some activity. Within days our Aqua Dragons began to grow. Each day they were bigger and my kids love watching them swim around their tank. As a mom one thing I really like about Aqua Dragons is that if they all die you can simply place your tank outside and let all the water evaporate and then start all over. Add your bottled spring water and your new eggs left in the tank by the previous Aqua Dragons will hatch again. I don't know about you, but this is my kind of pet. Aqua Dragons are super fun to watch because they grow at a rapid rate, my kids never seemed to get bored with them. Each day they'd run to the tank to see how much they've grown. 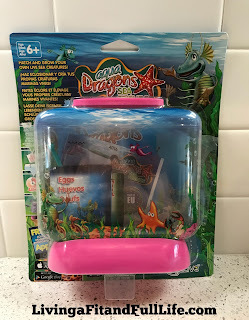 Aqua Dragons are terrific for kids and as a homeschooling mom of 4 I highly recommend them! Click HERE to learn more about World Alive’s Aqua Dragons! Aqua Dragons in Space, Newest Kickstarter Campaign, Will Raise Funds To Launch 13.8M Eggs Into Near Space & Package As Live Astro Pets For Kids! Follow World Alive’s Aqua Dragons on social media!